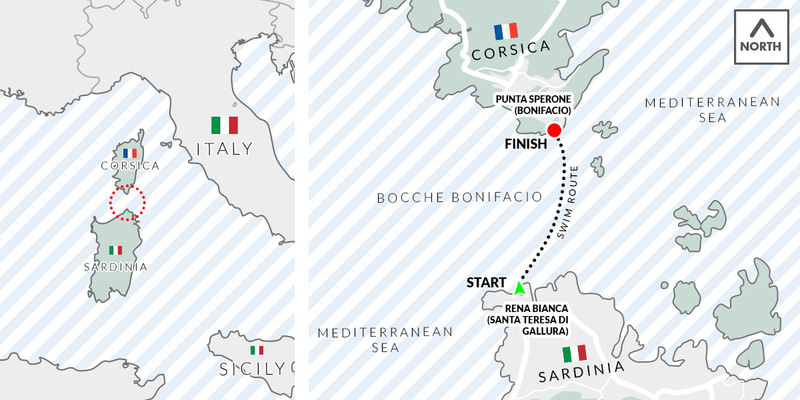 Swim across the Bonifacio channel in this 15K lifetime achievement crossing from Sardinia (Italy) to the French coast of the island of Corsica! You'll start on the beach of Rena Bianca, Sardinia (Italy) and cross to the beach of Punta Sperone, Corsica (France) across a stretch of blue Mediterranean Sea linking the two. We have helped the first American, Mexican, and Brazilian make this crossing, as well as the world record holder. Join the ranks! Your crossing will be overseen by Italian captain Tommaso Munatoni. In order to consider booking the swim crossing the Bocche di Bonifacio, please plan accordingly to allow 5 days, during which you will stay in the beautiful town of Santa Teresa di Gallura on Sardinia. Be aware weather and sea conditions may vary suddenly, requiring adjustment of the date of the swim. While there, practice swims are encouraged and we will provide you with training guidance and places to swim. 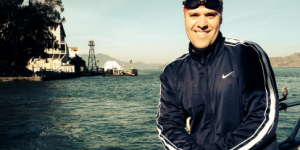 An endurance swim of epic proportions. You won't just scratch it off your bucket list - you'll join a new family. Or take the bus available from the airport to Santa Teresa de Gallura (trip of 1 hr.). What is Water World Swim International Membership? An amazing thing to have, that's what! By completing an international swim with us (or, by coming from abroad to complete a swim in the San Francisco bay with us), you are automatically a WWS International Member. 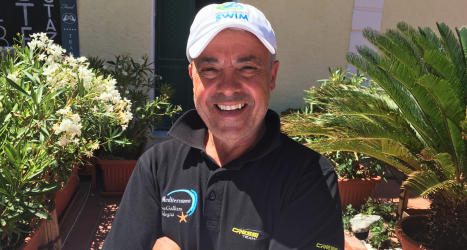 This privilege grants you 15% off any swim or trip with us and your swimmer profile on our website where we will store your times and achievements for all to see! What if I am already a regular WWS member? If you have both regular and international memberships, you'll enjoy the international benefits with the regular membership benefits, like 30% off Monthly Alcatraz and most annual events, and free Swim With Pedro. The discounts cannot be combined. Need a help booking your travel to Messina? Our italian friends from Private Tour in Italy are full-experienced. With more than 30 years on Touring business, they have reached different places over the world bringing a whole new touristic experience to their travelers. Finish on the luxurious azure shores of Corsica. We'll head back via the boat, but expect to day trip on this beautiful island! He became the first American to make the Bonifacio crossing in 2015. 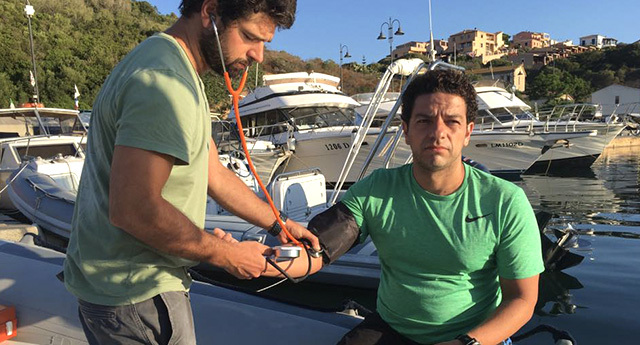 Gonzalo Nadal became the first Mexican to complete this endurance feat. 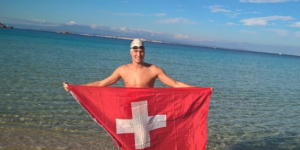 Robert was the first swimmer to make it across Bonifacio in 2018. Romano Mombelli made this crossing in world record time. 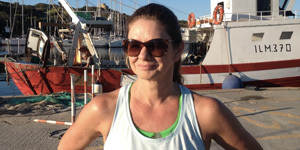 Alessandra Cima Rossi, from Dubai, became the first Brazilian to complete this swim. Tommaso Munatoni will pilot the crossing. He'll be looking out for you as you swim, and probably make you laugh along the way! Your swim will be fully supported by an awesome team. Your safety is paramount and the crew will work to keep you on track for success. 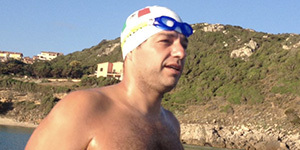 You must be at least 14 years of age to swim the Strait of Messina or the Bonifacio Channel. In addition, you must have an Echocardiogram (EKG) and Stress test performed by a doctor, valid within one year of your swim date. Without meeting either of these requirements, you will not be able to swim. We highly recommend travel insurance - and not just for your stuff! Swimming in the open water can be dangerous. While we haven't encountered any, there are jellyfish and you want to be covered in case the unexpected happens. We are not responsible for any swim or open-water related injures.